From the moment it was clear Dylan Wright was going to go down and wrestle at 160 during the postseason, a matchup with teammate Tristan Maughan seemed inevitable. Tom Rysinski/Pahrump Valley Times Pahrump Valley teammates Dylan Wright, right, and Tristan Maughan battle in the 160-pound final of the Class 3A Southern Regional Wrestling Championships on Saturday at Moapa Valley High School. 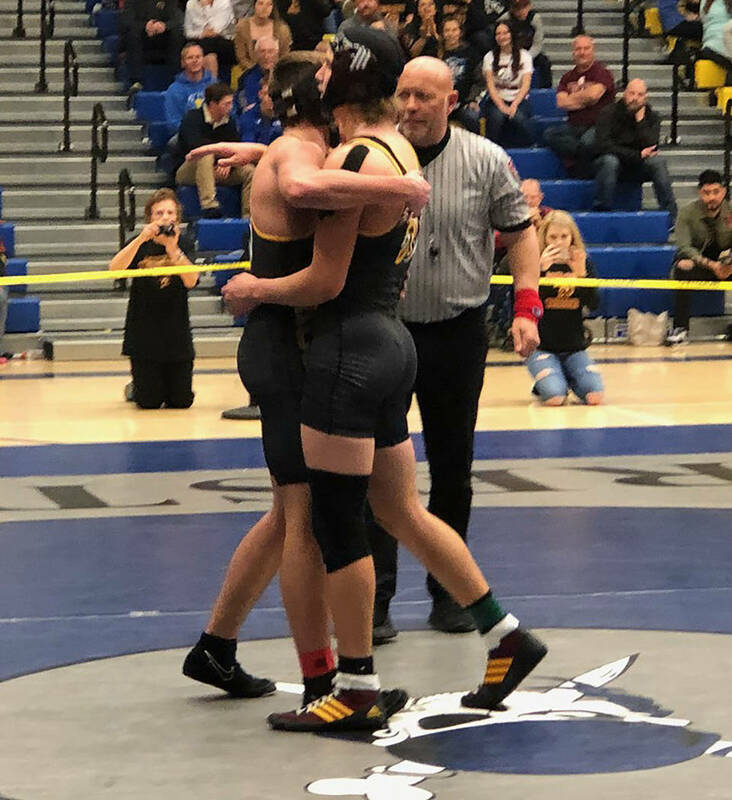 Tom Rysinski/Pahrump Valley Times Senior Tristan Maughan, left, and sophomore Dylan Wright embrace after Wright's 15-8 decision over Maughan in the Class 3A Southern Region 160-pound final Saturday at Moapa Valley High School. 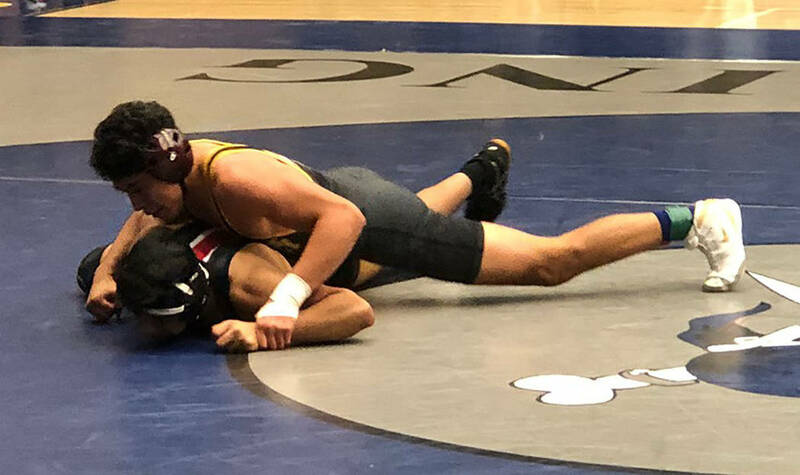 Tom Rysinski/Pahrump Valley Times Pahrump Valley senior Isaak Cruz controls Juan Vargas of Western on his way to winning the 145-pound title at the Class 3A Southern Region Wrestling Championships with a 4-0 decision Saturday at Moapa Valley High School. Tom Rysinski/Pahrump Valley Times Pahrump Valley wrestling coach Craig Rieger, left, will bring six wrestlers to the Class 3A state championships this weekend in Winnemucca, including region champions Isaak Cruz (145) and Dylan Wright (160). There were no guarantees, of course, and talented wrestlers could get in the way, but chances were the two would meet at least once, and possibly twice. One down, maybe one more to go. Wright and Maughan met in the 160-pound final Saturday at the Class 3A Southern Region Championships, and if it wasn’t a classic it definitely had its moments. In the end, the favored Wright pocketed a 15-8 decision and the region title. Maughan saw his best chance to beat Wright was trying to wear him down. After all, few opponents have made it out of the first period against him. Most of the action in the bout came during the second period, which opened with Wright holding a 4-0 lead. Wright made it 6-0 with a takedown, but Maughan escaped, recorded a takedown and briefly had Wright in some trouble. But Wright put together an escape, a takedown and three near-fall points to regain control of the match before Maughan rallied to close within 12-6 at the end of two. Maughan said success with his shots kept him in the bout. Wright did appear a bit tired, but with a healthy lead he only needed to avoid mistakes to win the title. Starting the third in neutral, he again scored the first takedown of a period, but with just under a minute left, Maughan earned a reversal and made one final push. But Wright held him off, finally getting an escape with 15 seconds left to forge the final 15-8 score. The two embraced after the bout. Would Wright have preferred not to face a teammate with a region championship on the line? By the time Wright and Maughan went at it, the Trojans already had crowned a region champion, as Isaak Cruz took home the title at 145. 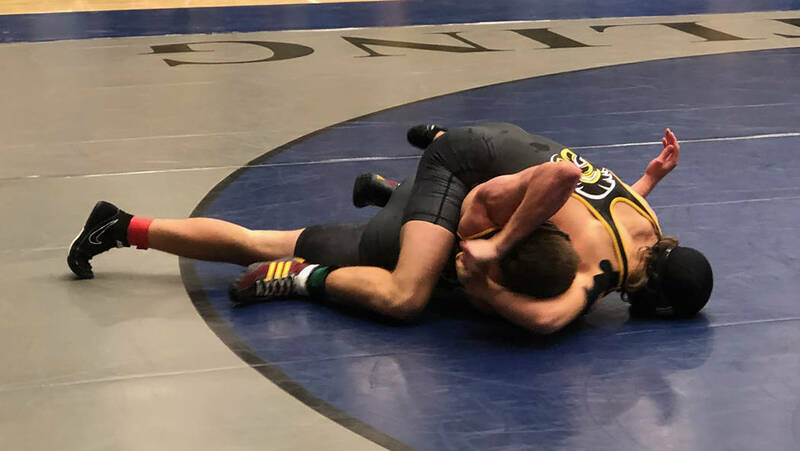 The senior had a bye in Friday night’s quarterfinals, then cruised to a 13-2 major decision over junior Ayden Fradella of Boulder City in the semifinals before putting together a rather mundane 4-0 win over junior Juan Vargas of Western in the final. 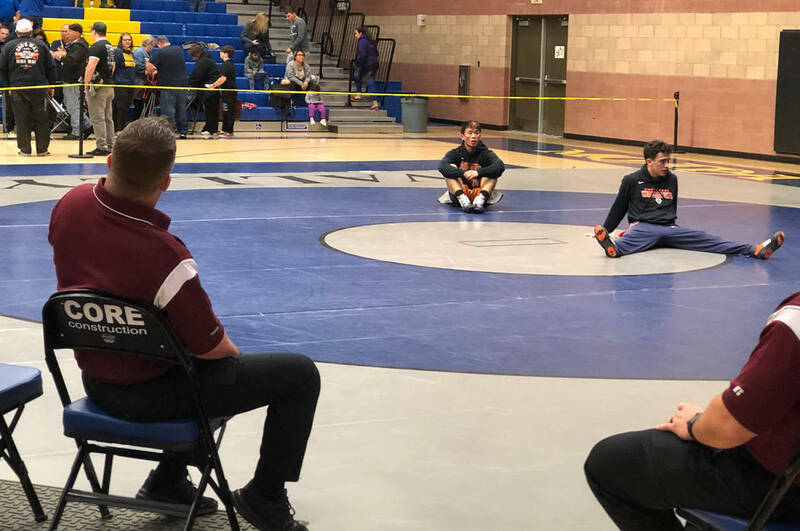 In fact, Cruz had beaten him very recently, pinning Vargas in 5:22 on Senior Night in Pahrump, when the Trojans clinched the Sunset League title. Cruz trailed 3-0 after two periods that night but dominated the third before getting the fall. Vargas, it seemed, had taken a few lessons from that. And what it is, is a region championship for a wrestler who placed fourth at 132 a year ago before making a quick exit from the state tournament. Team scores: 1. Boulder City 213, 2. Virgin Valley 204, 3. Western 150, 4. Pahrump Valley 147, 5. Mojave 143, 6. Chaparral 112, 7. Moapa Valley 99, 8. Valley 91.5, 9. Sunrise Mountain 70, 10. Del Sol 19. 145: Isaak Cruz d. Juan Vargas (Western) 4-0. 160: Dylan Wright d. Tristan Maughan 15-8. 106: Michael Garcia (Chaparral) p. Mason Prunchak :44. 126: Coby Tillery p. Curtis Brown (Boulder City) :44. 195: Anthony Pearson p. Toban Garcia (Western) 2:51. 113: Garrett Cosper p. Justin Arce (Sunrise Mountain) 1:20. 132: Justin Bonar (Boulder City) p. Henry Amaya 4:14. 220: Christian Monje p. Jaren Hafen (Virgin Valley) 2:50. 285: Armani McGhee p. Jose Medina (Valley) 2:36.